Ghost Stories came out to great critical acclaim in 2017. It is that rare beast - a successful British horror film. Structured around three interweaving stories, it manages to be entertaining and immensely watchable, as well as genuinely scary - and it also retains a British quirkiness and atmosphere. It was written and directed by Andy Nyman and Jeremy Dyson, both of whom have real pedigree: Nyman is an actor, magician and writer who has worked extensively on Derren Brown’s amazing stage shows, and Dyson is a key member of the hugely influential League of Gentlemen. Ghost Stories was initially a successful stage play, and yet the film manages to transcend its theatrical origins and uses the West Yorkshire countryside to great effect. Nyman also plays the lead character - a sceptical professor who wants to debunk the supernatural, but gets drawn in to sinister situations he cannot explain or control. 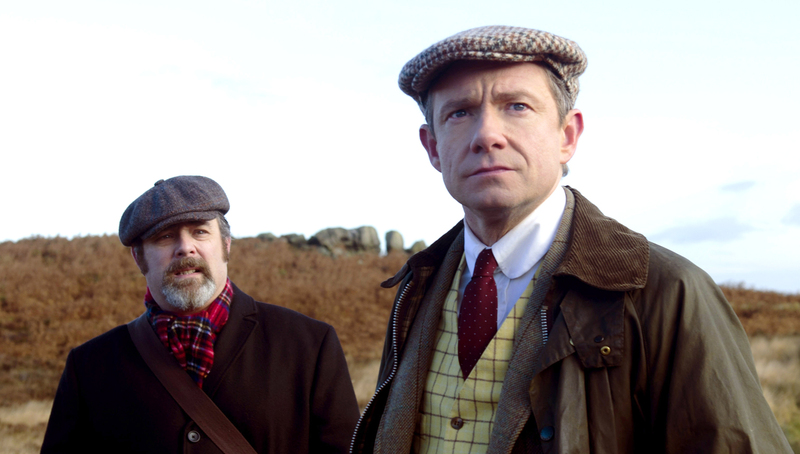 He is supported by a strong British cast, including Paul Whitehouse and Martin Freeman in lead roles. There are genuine shocks in Ghost Stories, so it is not for those of a delicate disposition. You have been warned! Doors 6:30 Movie 7:30. Tickets £5 Members £4. Sorry, you've missed this one. Oakwood Cinema is an organisation run by volunteers to help bring our community together and to provide an independent local cinema for the residents of Oakwood and Roundhay in Leeds. You can become an annual member for only £5, giving you £1 off every monthly showing. All rights reserved. © 2019 Oakwood Cinema, ROUNDHAY PAROCHIAL HALL. 5 FITZROY DRIVE. LS8 4AB. Email: info@oakwoodcinema.org.